This is the web home of Marsha Rogers and Megan Jones "Utah's Finest Mother/Daughter Real Estate Team." Marsha and Megan have a combined 36 years of experience serving the Wasatch Front which includes Salt Lake City, Sandy, Draper, Holladay and the rest of the greater Salt Lake area. Please feel free to browse this site to find out how Marsha and Megan can help you buy or sell your next home. When you use Marsha and Megan to help you buy or sell a home, you get the best Realtor® team in Utah working to make sure your real estate sale or purchase goes smoothly. Marsha and Megan will exceed your expectations by selling your home quickly and for top dollar or by helping you find the perfect home for the lowest price possible. In addition, Marsha and Megan will treat you with the utmost respect, honesty and professionalism. 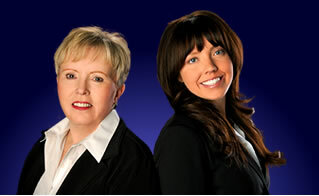 Marsha and Megan are proud to be licensed through RE/MAX Masters, Utah's premier real estate brokerage. So you can feel safe knowing you are working with the best of the best in Utah real estate.